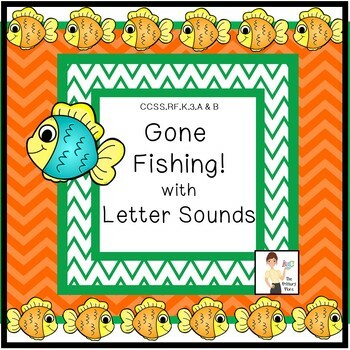 The Gone Fishing with Letter Sounds Center Game created by The Primary Place is ideal for Pre-K - 1st grade. There are 14 pages in this PDF file. 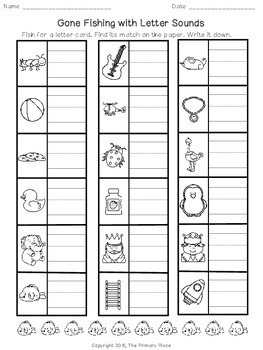 You can make this a center or create enough for the class to do this activity at the same time in small groups. Each group will need 1 fishing pole (A fishing pole is one dowel rod with a piece of long yarn tied/taped to the end of it. On the end of the yarn tie a large paper clip. ), 1 set of fish cards laminated, cut out with 1 large paper clip attached to each one, pencils and handouts. Once you have the fishing poles made, it is easy to get fish for different skills and keep fishing! 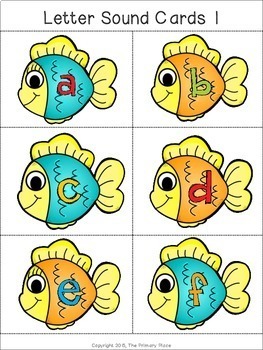 -Letter Sounds Fishing Cards 1 - 5 - I recommend printing on cardstock, laminating and attaching a large paper clip to each card. If you would like to be notified about new or updated products, click on the "Follow Me" button above. Check out our other Gone Fishing center games too.